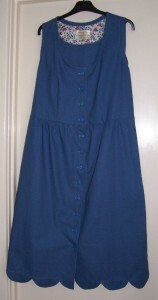 Many years ago I made a similar pinafore dress but that time it was in a Baby Pink Gabardine. Nowadays I think I am too old for such a solid block of Pink! I originally purchased this fabric to make a version of the Merchant & Mills Dress Shirt but the joy of being my own dressmaker is that I can change my mind. 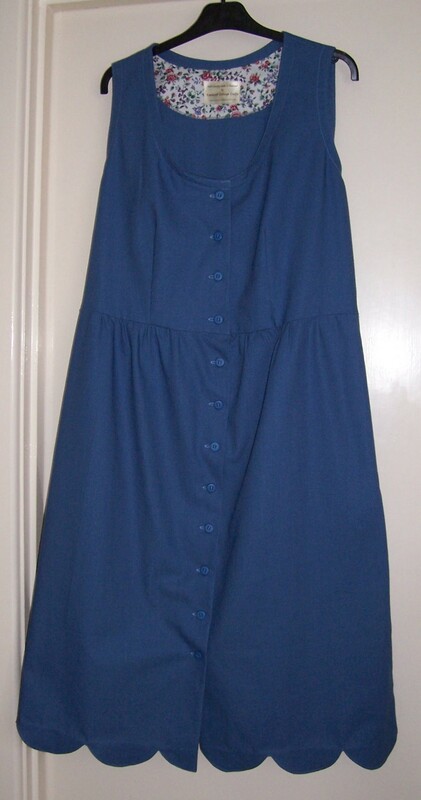 I used the bodice block from the Needlecord Pinafore dress that I made in March this year but this time decided to add buttons and buttonholes through the bodice and the skirt. 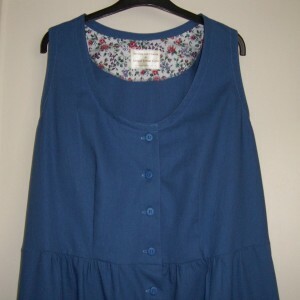 The special feature of this version was to be a scalloped hem. The first thing I did was to add a floral cotton print neckline facing which included my pre-printed label to the back bodice. I had insufficient fabric to make all-in-one neckline and armhole facings so decided to use a 2” wide bias binding. I top-stitched close to the edge and at the outer edge of the bias – about ½” away from the first line of stitching. To improve the fit of the bodice I added a couple of darts in the back. The skirt was cut from 2 panels each 36” wide x 32” long. One panel was then cut in half to be the centre front opening. I made two pocket bags which are stitched at the side seams and also included in the waistline stitching so that they don’t flap about. I used a handy funnel to draw the scallops and they worked out fine. 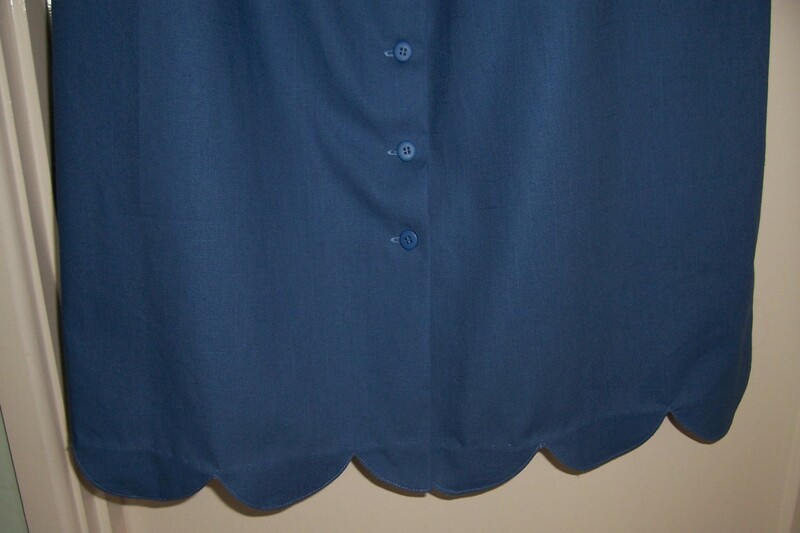 Although it does not show in the photograph, when worn, the right scallop overlaps perfectly on to the left scallop to give a continuous line. The edge of the scallops is top-stitched for added emphasis. There are 12 buttons from my stash which fortunately match really well with the Blue fabric. This garment took quite a long time to put together so my next project is a really simple and straightforward shift dress to Simplicity 2120. Many thanks for your kind words, glad to hear that you are enjoying my posts.